For those of you that always enjoy checking out the strange novelty lights, here’s one more. 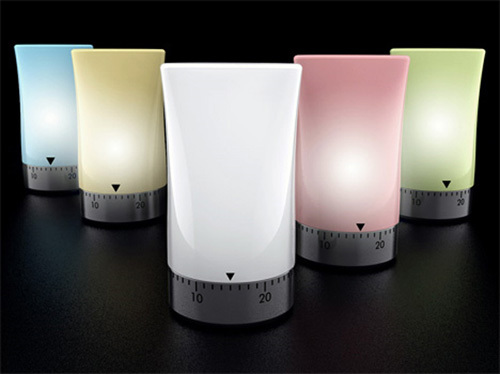 This one is meant for your kitchen itself and uses an odd method to power the small ambient glow that it gives off. It won’t stay on all the time, purely when the timer itself is on. So it’s not something you could leave on at night next to the fridge to make it easier to sneak a midnight snack. Oddly in order to power this LED light it uses mechanical energy. When you rotate the base to set a time, it of course cranks the mechanism inside. Then as it slowly unwinds, all of that stored energy will power the lighting aspect of the timer. So there really isn’t much of a point to this at all, besides that when the glow goes out it’s another reminder that your food is done. It might also be a good idea for those that are hard of hearing. Sure, they could always check the numbers, but it’s much easier to spot when the light has gone out. Right now this is just a concept design by Jasper Hou.